Are our names not content “Chi” in them? What is Chukwu? are you not called by his name? Biafrans will celebrate the Atonement on Oct 11th to 12th 2016. This is the third year we, as a nation, are going to observe the long forgotten feast commanded by Chukwu Okike Abiama. Since the days of Jeshua, the children of Israel had not done this. This national feast has been neglected for a protracted period of time. The reason is because nobody told us we are the children of Israel. The Christian church only brain-washed us to believe that the only thing that matters is to believe in Jesus. But the Bible is very clear that Israel (Biafrans) must keep the laws, commandment, statutes, and feasts (Lev 23: 1-37, 16: 1-34, Ex 20: 1-17, Deut 14: 1-21, Ps. 119, Mt 19: 16-22). Because we have not worshipped Chukwu Okike Abiama by keeping the laws, statutes, commandments, and feasts, He placed a curse on us and scattered us abroad. This is why some of us are in USA, UK, Germany, Italy, Ghana, Turkey, Kano, Sokoto scavenging. He let our enemies oppress, marginalise, and kill us. All of us are living the pains of disobedience. But thank God for sending mazi Nnamdi Kanu who opened our eyes to understand why we are suffering and taught us what we need to do to return to our former glory because God created the world for Israel sake. But disobedience has made us be at the bottom that allowed cattle rearers to preside over us. Biafrans will attest to the fact that the Atonements we observed the last two years, has been life changing experience in our history as all the saboteurs in our land began to manifest and be dealt with. Thanks to the divine wisdom and bravery of our leader mazi Kanu. With this Atonement, we wish to afflict our souls through fasting and prayers and confess our sins of disobedience to Chukwu Okike Abiama and ask him for forgiveness so he will heal us and destroy our enemies. Right now, we do not have any power or zeal to discomfit our enemies. But God can. He has promised that if we atone and repent, He will restore us because we are His chosen that are called by His name. 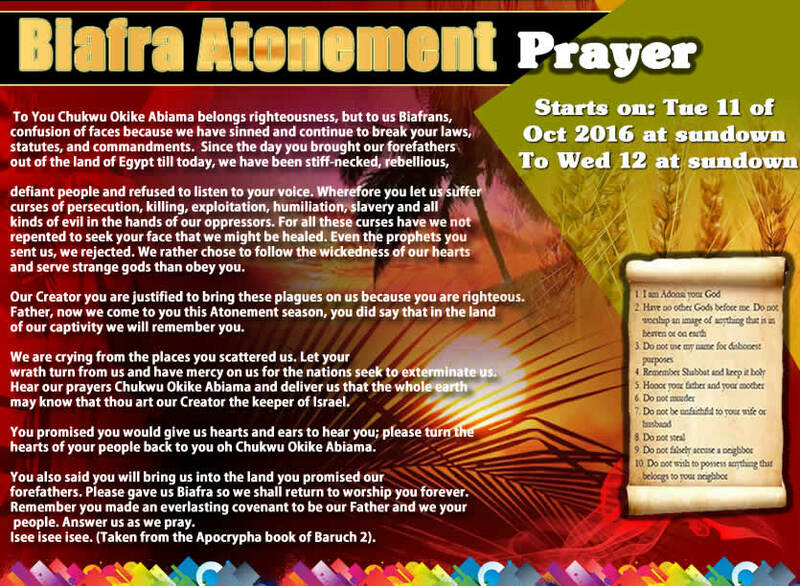 Therefore, we enjoin all Biafrans to join us on this Atonement coming up. Returning to Chukwu Okike Abiama is the only solution to our problem. Chukwu Okike Abiama allowed us to suffer, and only Him will restore and heal us. The solution does not lie with man but with God. Therefore, let us make this occasion a worthwhile one. May Chukwu Okike Abiama bless each and every one of us as we come together in humility to obey Him on this Atonement.